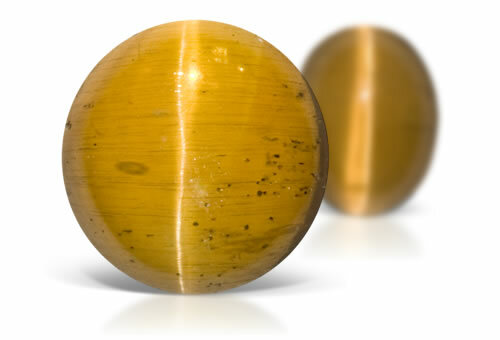 The term cat's eye, or chatoyancy, is used to describe a phenomenal optical property in gemstones, in this case apatite. The effect, when present, appears as a bright, narrow slit similar to the pupils in the eyes of your favorite feline. This phenomenon is caused by parallel fibrous or needle-like inclusions that interfere with the passage of light throughout the crystal, scattering and reflecting light back to the viewer as a thin line. Chatoyancy is the only known phenomenon seen in apatite. The most common colors for cat's eye apatite are bluish green, green and yellow. Brazil and Sri Lanka are the principal sources of chatoyant apatite, although it may also be found in Madagascar and Tanzania. Apatite is a type II stone. Fairly well defined chatoyant band that is made up of finer tubular inclusions than cat's-eye tourmaline.